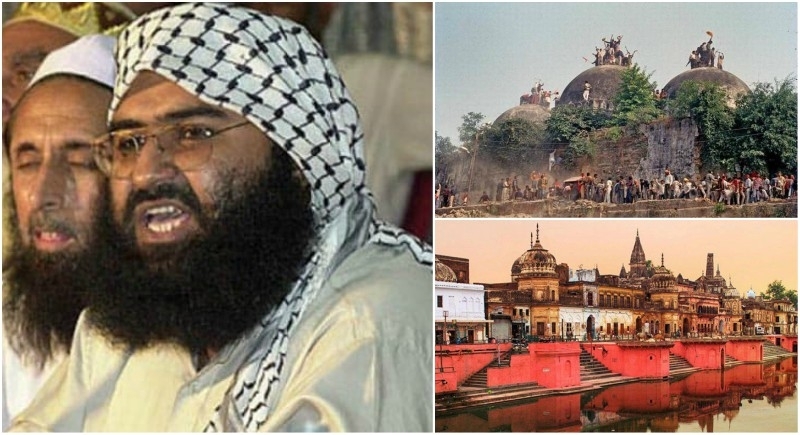 New Delhi, December 1: Vocalising hate against India, terrorist Masood Azhar has released a tape issuing threats over building the Ram Mandir in Ayodhya. Adhering to his fundamentalism, the Pakistani terrorist has attempted to create a fake fear over the Babri Masjid-Ram Mandir dispute. "That Babri Masjid that was taken away from us because of our cowardice and our sins. A Mandir was created in that place. These days non-Muslims are assembled over there for the issue. They are demanding to build Ram Mandir. They have swords and spears in their hand, while the Muslims are scared. The call for Babri Masjid is a test for the Muslims, it's a dangerous time, we are ready to sacrifice our lives. I pray to you, to give us back the Babri Masjid, give us back the honor of the Muslim Community. Forgive us, as we have sinned," he said. He said, "Just stop the construction of Ram Mandir, and show your warriors a path. They are desperate to show you their love and loyalty. The slogans crying 'Allahu Akhbar' will be raised on the dome of Babri Masjid." "The bloodshed, injuries, the bodies imbibed with the perfume of love, the parts of the body. The victory of religion, oh lord not just one or two, thousands of men are ready in your service, they are emotional, trembling that the Babri Masjid should be brought back. We have to protect our mothers' dignity. We won't let an idol be built in the place where we prostrate," he added. "Oh Lord who enlightens the darkness, just show us a path, if Allah wills this yellow terror will turn into a red storm. Then Thackeray will be on his knees, Modi will crumble like a cobweb. Those who are too fond of being a Muslim Leader, they should be responsible enough and tell India that Ram Mandir instead of Babri Masjid will not be tolerated," Azhar said.